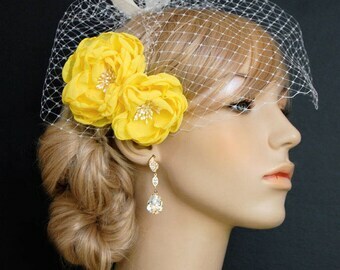 These flower sash accessories, brooch, hair flowers are a beautiful pair to accessorize any Bride! Completely handmade, each parchment colored Taffeta flower petal is carefully hand cut and shaped. 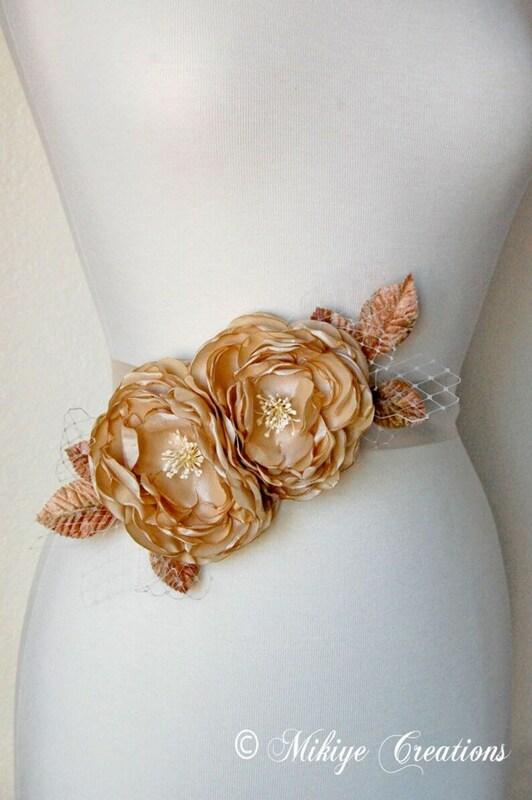 Petite buttery white stamen accent the centers and light tan and brown velvet millinery leaves softly color the sides. Ivory Russian netting adds a little more texture and flair. Flowers are separate and have both a pin and an alligator clip with teeth attached to the back. As seen in the photos these flowers are wonderful worn in many ways. Easily pinned to a satin sash for a pop of color around the waist as well as pinned to any clothing to make a gorgeous accent around the neckline of any outfit. Wear one or both in the hair for a glamorous vintage-inspired look! 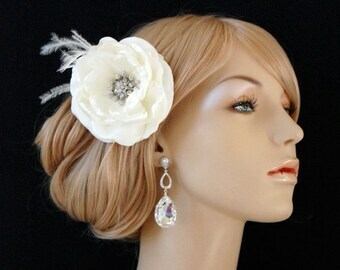 The alligator clip with teeth secures the flowers at any angle in any hair type. Smaller flower approximately 3 inches wide. Larger flower approximately 4 inches wide. Wonderful worn alone in the hair as well as an accent to any veil. *If you like these or are interested in something similar PLEASE contact me and I will do my best to design something you will LOVE!